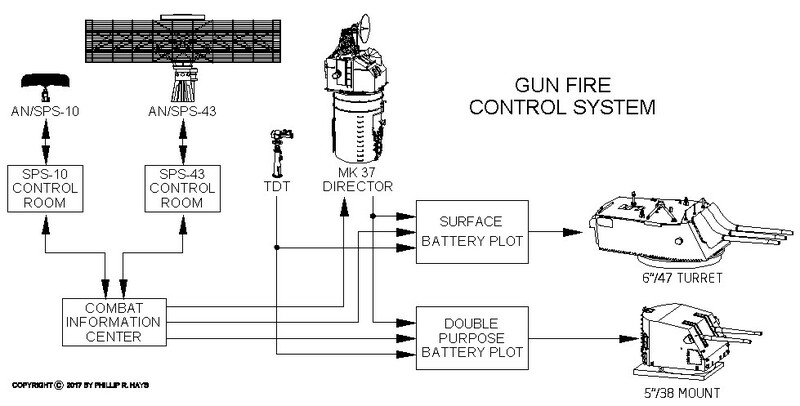 The main elements of the OK City Gun Fire Control System (GFCS) are shown in the diagram. The ship could conduct direct fire at visible targets like aircraft and missiles, ships and boats, or targets on shore. The guns could also conduct indirect fire against distant targets behind hills or over the horizon. The Bridge had ultimate responsibility for approval of gunfire missions. Combat Information Center had the responsibility for deciding how to engage targets - with guns or missiles. 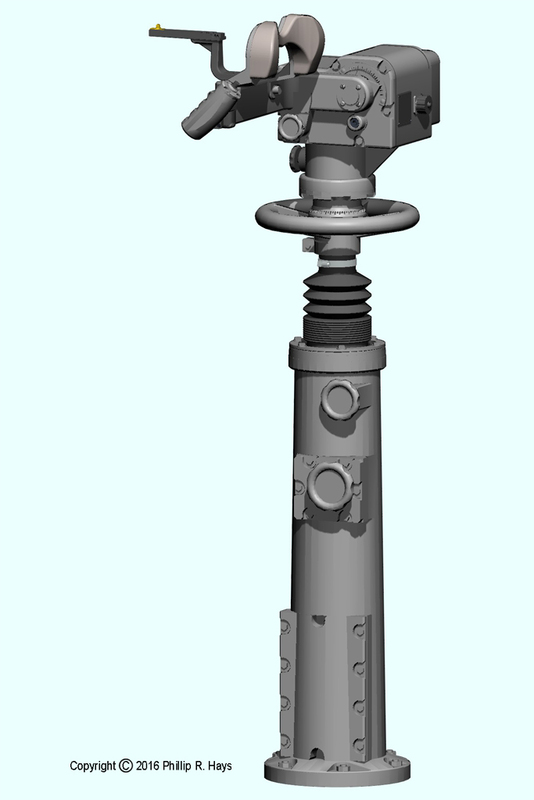 The 6"/47 turret was controlled by the Surface Battery Plot Room. The 5"/38 mount was controlled by the Double Purpose Battery Plot Room. 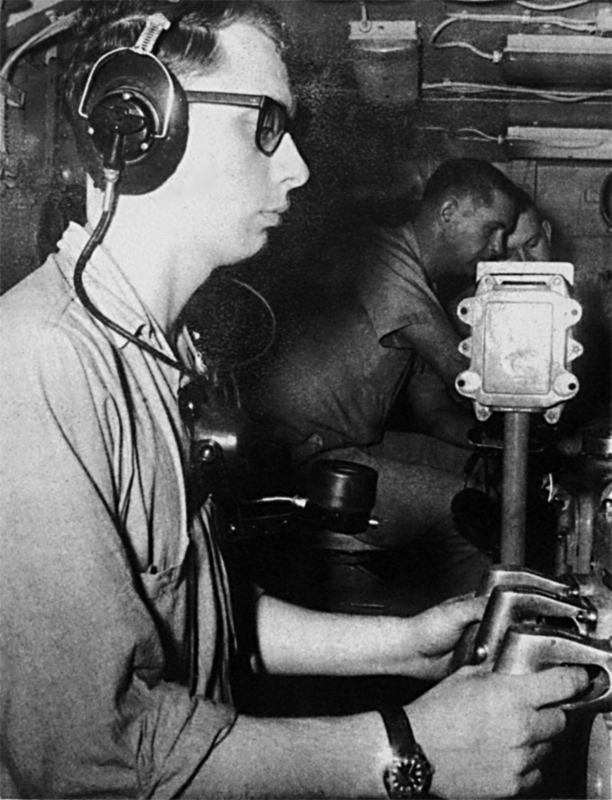 Each Plot Room had a gun battery computer that received range, bearing and elevation information from the Mk 37 Gun Director, ships heading, course and speed from the ship's gyros, wind speed and direction, and ship roll and pitch information from the stable element. The Gun Plot crew entered information about the type of ammunition and powder charge that was being used. The computer used this information to calculate the bearing and elevation of the guns to deliver the projectiles to the target. 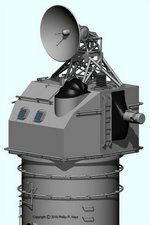 For indirect gunfire missions (when the ship was shooting at a target not visible or detected by radar) the ship could fire on targets at specific geographical locations. Either or both of the 6"/47 or 5"/38 guns could conduct indirect fire missions. For Naval Gunfire Support (NGFS) missions supporting friendly troops on shore the Weapons Liaison Officer (WLO) in CIC communicated with a Spotter on the ground or in an airplane. The Spotter supplied map grid coordinates for the target. For indirect shore bombardment against enemy positions and installations the ship could fire at specific geographical coordinates without a spotter, but this was less precise than if a spotter was calling the fire. The crews in CIC and Gun Plot plotted the target position on charts and calculated the bearing and range to the target. This provided a double check of the firing mission. The Mk 37 Director could be used to determine the ship's position by tracking a reference object on shore whose map position was known. The Director sent range and bearing information to the Mk 48 Computer in the Surface Plot Room. The computer converted geographic coordinates to a relative range and bearing to the target from the ship and sent this information to the gun aiming computers. The ship's position, course and speed, roll and pitch, target range and bearing, ammunition type, wind direction and speed and the height of any obstructions (such as mountains) was fed into the computers to correct the gunfire solution. They calculated the gun elevation and bearing to fire the guns. While this was happening Gun Plot would decide what type of ammunition to use to engage the target and the crews in the turret and mount, projectile handling rooms and powder magazines would be loading ammunition into the guns. Often there were two trajectories for delivering the rounds to the target. A low angle shot would send the projectiles more or less horizontal to hit targets like caves or vertical walls. The high angle solution lobbed the rounds high so they would plunge almost vertically on the target. This was most effective against hardened targets like concrete bunkers. The high angle solution also allowed shooting over obstacles like hills or buildings. The guns were fired with three triggers or "keys" on the stable elements in the plot rooms. The left "Salvo Signal Key" sounded a bell in the turret or mount, in the Director, on the Bridge and in the Plot Rooms to warn that the guns were about to fire. Then the right hand "Hand Firing Key" was pulled to fire a single salvo from the guns. Normally the bells would ring twice, followed by the gun firing - buzz, buzz, BANG! When the computer was tracking the target the the middle "Automatic Firing Key" was pulled to cause the guns to fire automatically each time new rounds were loaded. Releasing the trigger stopped the firing. When a firing solution was reached the ship reported "Ready" to the Spotter and reported the expected flight time to the target. On the Spotter's command a single spotting round was fired. The WLO reported "Shot" to the Spotter to let him know the round was fired. When it exploded the Spotter reported "Splash." The Spotter reported any range and bearing errors and gun plot made the corrections. Another spotting round was fired, and this process continued until the rounds were falling on the target. Then the Spotter ordered "Fire for effect." Then the ship began firing multiple gun salvos as fast as it could until the target was destroyed and the Spotter ordered "Check fire." During World War II the Oklahoma City carried out shore bombardment operations against targets on the Japanese home islands. 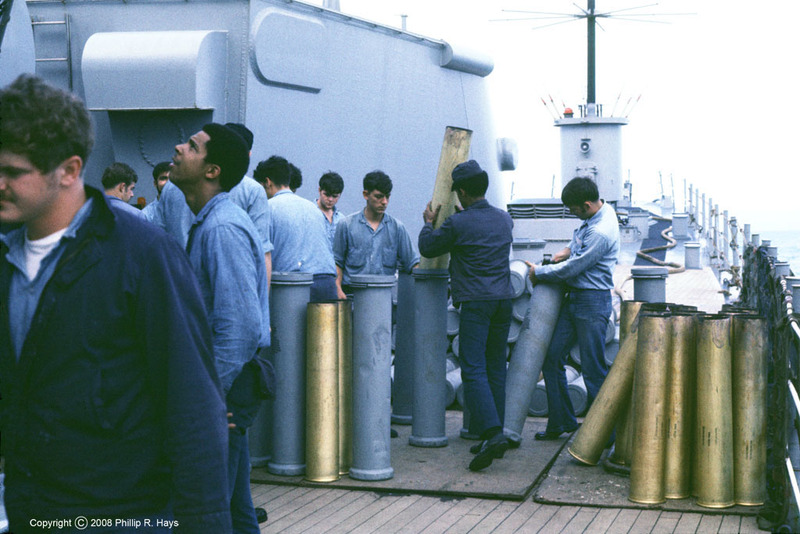 In Vietnam the OK City conducted hundreds of NGFS missions in support of allied troops ashore and shore bombardment against targets in North Vietnam. Direct fire missions were conducted against land, sea and air targets that were close at hand and either visible or were being tracked by radar. CIC conducted continuous radar watches on the AN/SPS-43 air search radar and the AN/SPS-10 surface search radar. As surface or air contacts were detected they were tracked and the course, speed and closest point of approach to the ship were determined. Lookouts topside and the Bridge watch also reported any visual contacts and provided visual identification information to CIC. The Electronics Counter Measures watch in CIC examined any signals emanating from each contact to determine the type of object being tracked. If an air or surface contact was determined to be hostile, CIC would decide how best to combat it. 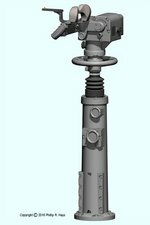 If it was decided to engage the target with the gun battery CIC would send bearing and range information to the the Mk 37 Gun Director. The Director had a Mk 25 radar to track air and surface targets. It also had an optical range finder system to determine range and bearing to the target. Once the target was acquired the Director crew would track the target continuously. Range and bearing information was sent to the appropriate Gun Plot Room computer. Personnel in the Mk 37 Gun Director, lookouts topside, or personnel on the Bridge could provide bearing and range to visible targets. CIC could assign the Director to search for and track aircraft and surface targets observed on the SPS-43 air search radar or the SPS-10 surface search radar. For visible targets the relative bearing to a target could be passed by voice communications to the Director Officer and crew. The Director could be controlled electrically by a Mk 23 Target Designation Transmitter. Two of these were located high on the ship on the O5 level in front of the Mk 37 Director. The TDT had a pair of binoculars mounted upon a stand. The binoculars could be rotated and tilted up and down. Circuits in the TDT converted position into electrical signals. When the TDT operator had a target centered in the field of view he pressed a button to send the information to the gun plot computers. The computers then rotated the Director to the bearing and elevation to start the target acquisition process. The Mk 37 Director had both optical and radar tracking systems. The Director's Mk 25 radar could detect and track targets. An optical range finder allowed determining the distance to a visible target. Pointer and Trainer operators used optical telescopes to fine tune the bearing and elevation to the target. The bearing, range and elevation information from the Director was passed electrically to the computers in Gun Plot. As a backup, the Director could also pass this information by voice communications directly to the turret or gun mount if all else failed, but this method was slow and not especially accurate. 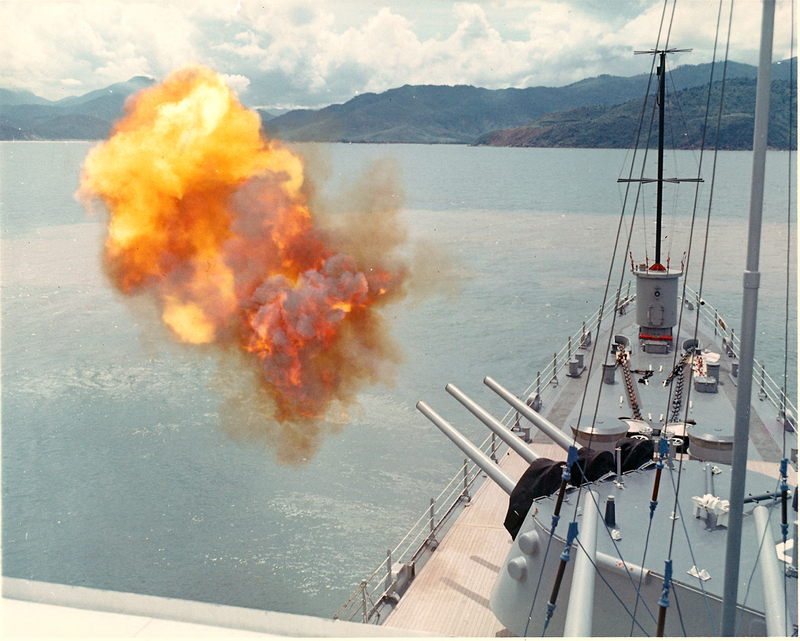 When engaging direct fire targets the Director Officer fired the guns from the Director, He had three triggers like the stable elements in the plot rooms, and used the same procedure to fire the guns. The Director Officer had a pair of binoculars that were trained on the target that was being tracked so he could observe the explosions of the rounds. The Director crew observed the accuracy of the gun fire and passed corrections to the Gun Plot rooms. The computers in Gun Plot followed the signals from the Director and compensated for ship motion and speed, and for winds and controlled motion of the guns. When firing projectiles with time delay fuzes the computer calculated the appropriate delay and sent the information to a fuze setter in the mount that adjusted the time delay immediately prior to loading the projectiles into the guns. Gunfire would continue until the target was destroyed or the Bridge ordered a cease fire. The ship also had a special direct fire procedure for "zombies." These were low altitude sea skimming anti-ship missiles that might come in undetected by the ship's radars. If a lookout, Bridge watch or the Director crew saw an approaching missile they shouted "Zombie! Zombie!" over the ship's interior communications network and gave the relative bearing. 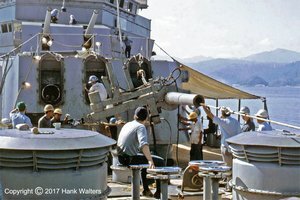 The 5"/38 mount immediately swung to the opposite bearing and began firing chaff rounds into the air over the ship - in areas where missile attacks might happen (off the North Vietnam coast) chaff rounds were always loaded into the 5"/38 guns when no other fire mission was in progress. The chaff would appear as a larger target than the ship and could fool the missile into attacking the wrong target. After a few chaff rounds were fired anti-aircraft rounds with proximity fuzes were loaded while the mount swung around to face the target. Then automatic firing at the target commenced. While this was going on the ECM watch in CIC initiated counter measures to take control of the approaching missile and send it somewhere else. During the Vietnam War the Oklahoma City occasionally engaged in running direct fire gun duels with North Vietnamese shore batteries. When enemy guns began firing on the ship the Gun Director Officer returned fire at the observed gun positions until they were silenced. At the Battle of Dong Hoi the ship was attacked simultaneously by shore batteries, torpedo boats and MiG 17 fighter bombers. Although there were many shootouts and hundreds of rounds were fired at the ship, the only damage to the ship during the war was a broken antenna wire caused by shrapnel from a near miss artillery round. The enemy was not so fortunate! The NGFS records list over 1500 enemy targets damaged or destroyed using about 2100 tons of 5" and 6" projectiles. While the gun battery was engaging a target the lookouts, bridge crew and CIC radar operators watched for other ships and aircraft, friendly or hostile. The bridge watch also had to maneuver to prevent the ship's superstructure from blocking the path to the target while keeping the ship in formation with other ships if they were present. CIC and the bridge also kept track of the ship's position to avoid running aground. They also checked to be sure friendly units did not cross into the line of fire. In the powder magazines and projectile rooms crews were busy supplying the type of projectiles and powder called for by Gun Plot. It was a busy time. After the guns had been firing for a while the gun barrels became very hot and paint blistered and peeled from the barrels. During rapid fire the guns were loaded and fired as fast as possible. Occasionally a loaded gun failed to fire. There were electrical and mechanical means to detonate the powder charge, but if these failed a dangerous situation occured. After an attempt to fire the gun failed the breech could not be opened to unload the gun because the powder charge might explode at any time. If the ammunition remained in a hot gun long enough it could "cook off" and explode. This would destroy the gun and turret or gun house, and might possibly cause the magazines to explode and sink the ship. In the event of a "hot gun" ammunition would be removed from the turret or mount and the crew was evacuated. Charged fire hoses were always laid out on deck during fire missions in case of a hot gun. A fire hose would be inserted into the gun barrel and water would be directed onto the outside of the gun barrel from other hoses. After the gun was cooled, and after a sufficient waiting period, the gun could be unloaded. The faulty ammunition was heaved over the side immediately. 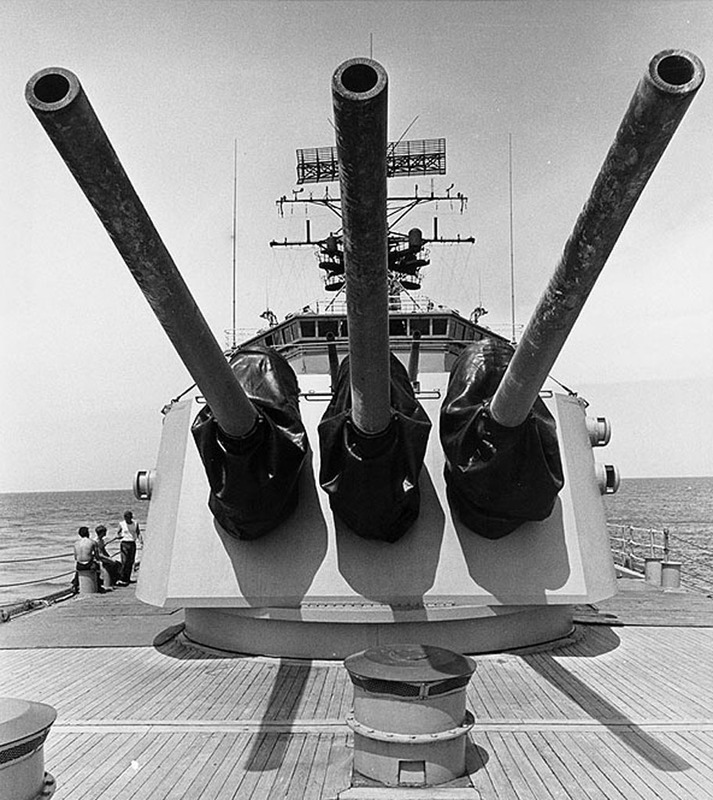 When a gunfire mission was completed the decks around the turret and mount would be covered with spent brass powder cases that had been ejected from the turret and mount. The gun crews collected the cases and placed them in powder shipping containers for return to an ammunition ship or ammunition depot for recycling. Some of the cases might have been lost over the side if the ship was rolling during the fire mission. And some of the cases just mysteriously disappeared, only to return later as ashtrays and other "craft projects." We occasionally paid for a quick hull paint job in Hong Kong with a pile of spent brass shell cases. Every time a gun was fired it gained a little bit of wear from the projectile passing through the barrel. This added up and after a certain number of rounds had been fired the wear became great enough that it affected the performance of the gun. The range and accuracy decreased, and eventually it was necessary to replace the gun barrels. Average barrel life was about 750-1000 rounds for the 6"/47 guns and 4600 rounds for the 5"/38 guns. The barrels fit into the gun mechanism with a twist to lock "bayonet type" locking mechanism. So it was just a matter of turning the barrel and pulling the barrel out. But the barrels were pretty large. The 5"/38 barrel was about 12 feet long and weighed 3990 pounds. The 6"/47 gun barrel was about 23 feet long and weighed 9640 pounds. Regunning was done in shipyards and required very large special tools, cranes and a lot of muscle power. What is a "short case?" Thanks to Hank Walters for the use of his photos.